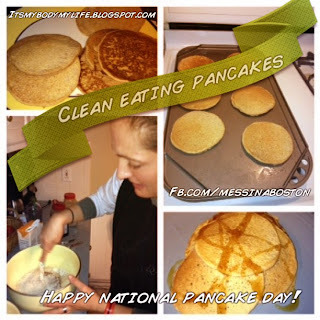 I found this recipe on The Gracious Pantry and made them in honor of National pancake day....they were so good and easy! I used Agave Nectar instead of syrup. Step 1 – In a large mixing bowl, whisk all ingredients together until you have a smooth, slightly thin batter. Step 2 – Using a non-stick pan, use a small amount of oil to coat the pan. This is more for browning the pancakes then anything. So you really do not need much. The pancakes will end up being browner than a normal pancake due to the banana. Step 3 – Pour the batter into the pan, but keep the heat somewhere between low and medium. This won’t cook properly on high heat. They take a little longer to cook, but they are totally worth it. Step 4 – Serve with maple syrup, or peanut butter, Agave Nectar, Honey or just plain mashed bananas and a side of scrambled eggs!